In this edition of The Amazins, The Genesis Goons Decree is Music in Coma! During this Parallel Moment of Terror, the Space Lawyer seeks the release of false flag operation fighters, complicating the whole story. The Amazin Warriors are propelled in the battle of their life; their mission: Rid the Earth of the Genesis Goons, at any cost! "Metalurges cry out at Goons escape" --Sludge: Kriminy! To compete is sound for Metalurges dwelling, but these Goons want stake on our mind-set, heavy. Their betrayal will be their ultimate humiliation - - and their last! Lacy Lips: I like their sound, but I love their comics. Mermeida: May we never loose our following, the earthbound doubles, empty-eyed metal heads that urge to follow, like cultists we. But goons, their loose-lips, mad-eyes, grinning, I worship not these thoughts in my metallic skull. Lakarhythmics: Dare we, O dense music benders, urge on this challenge to our followers, of this universal show? So be it, our glory be the greater! The Amazin Warriors are propelled in the battle of their life; their mission -- to rid the Earth of the Genesis Goons, at any cost! Background on Space Law refers to Music in Coma: Breaking the Spell of Silence in the current E-Premiere issue. Stay tuned . 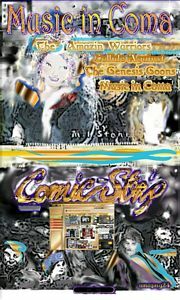 . .
Visualize a Comic-Strip of Your Lives: Make a Statement, Submit your Art Online or Order a Personalized issue, with your theme in mind, your favorite real person and friends, starring in. Drop that in your cart and hand it out! Here is how you can send us your works currently being displayed at our Comic-Strip Public Online Gallery headquartered in NYC. Comic-Strip Cameo's first ever natural selection of Gallery Works not based on much more than motive and perspiration. Viewers can chose a rating for each piece, landing a yearly Gallery Voter's Choice Prize. Editorial Requirements . Property and Privacy Rights . Previous Gallery Winners & Losers. . .
" Write-in votes will be allowed in the Comic-Strip Cameos Voter's Choice elections for best strip submitted to Public Gallery. "Black Cloak/False Flag Operation insecure: for the Amazin Warrior Women, the heroine types. " It's Another Market, Mother of all Boars; Insults shouldn't break my bones . . .
"Mstone wrote and drew the thing and is looking for work. Is there someone in your life that you'd like to see stripped? (Saturday Feb 14 , 2004) Intergalactic Femme Fatales, the Amazins, counter-strike the universal nemesis duo, known to the earthbound as The Genesis Goons, which have been making life tenuous, uncomfortable and jittery. The anti-heroes live out their form of life in a parallel universe which corresponds to ours in many ways, eerily similar world leaders and hidden forces intent on making their beliefs, of One Religion, One World, come true, the One World Goons. That's how they're known in their land.